The Russian Silkstone gang that is. Well…not all of them. Darya will be here sometime in late summer but I just couldn’t wait to do a group shot. 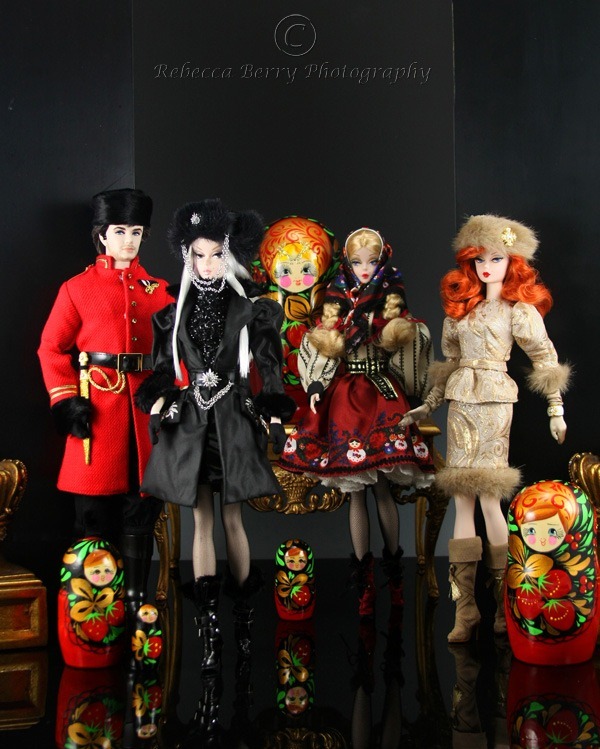 I received Verushka today and I was so enthused I just had to get the gang into the studio. First of all, let me just say it took a little while to warm up to Verushka. That hat! I guess I am just not the floppy sides down Elmer Fudd hat kind of girl. I was going to just take the thing off except I had heard stories that she is sparsely rooted under the hat. I decided to just tie the floppy sides up ( like any good hunting hat and much more like the Elmer Fudd we know and love) and I have to say I like it WAY better. I love the platinum blond with the black on this lady. Very dramatic and that is just what I was looking for with this line. After seeing many amazing photos that people have taken of Ekaterina with her hat off, I decided to remove her hat and reposition it. LOVE it now. I had thought I might replace the hat with a fur Dimitha hat but for now…she will keep her original hat. Finally, I am so excited to be using these amazing Russian stacking dolls I found at a doll show recently. I was encouraged to purchase this particular set by a dear Barbie friend ( cough, cough Silkyfever, cough, cough) and I am so glad I listened to her. And last but not least….little Mila. This entry was posted on April 21, 2011 by raberry65. It was filed under Barbie, Silkstone and was tagged with BFC Exclusive, BFMC Barbie, Doll Diorama, Doll Photography, Ekaterina Silkstone Barbie, Inside the fashion doll studio, Mila Silkstone Barbie, Nicolai Silkstone Ken, Rebecca Berry Photograhy, Silkstone Barbie, Verushka Silkstone Barbie. Glad you got my reference. My thoughts exactly! Love the ear flaps for comfort…for style? ?..not so much. Once I pulled those flaps up, I could enjoy this lady so much more. Thank you! I am glad you liked the photos. 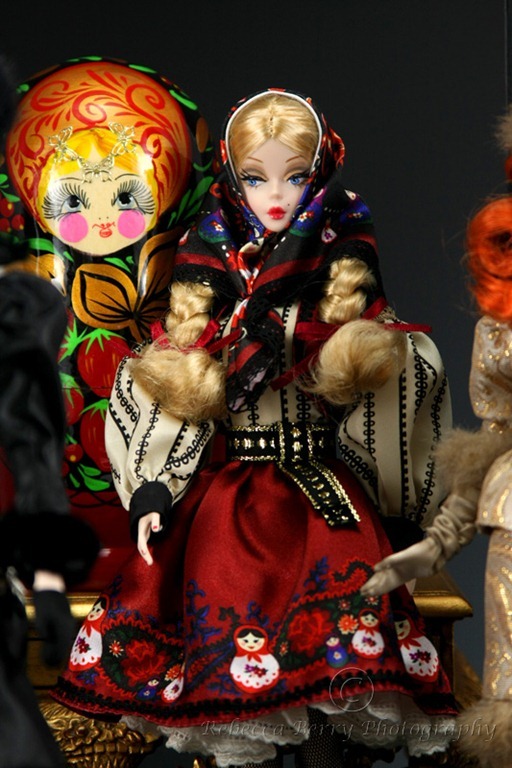 I love these photos and I love the nesting dolls! I was dubious about Verushka’s hair and am sorry to hear that it is sparse, since the hat would have to go if she were to model my fashions. Definitely an improvement to pull up the flaps. Hi Hilda! Thank you so much! Love your new fashions my dear. I am saving my pennies to purchase a couple of your lovley creations at convention. Hope to be able to spend some time catching up too. 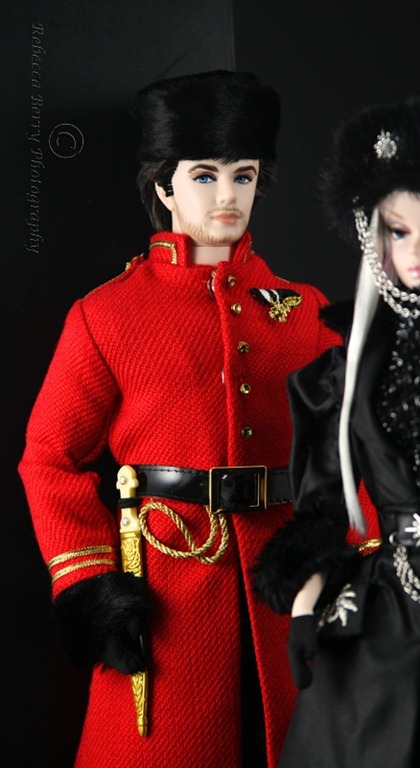 Late in responding to your new photos with the stacking dolls – they’re excellent Rebecca! They’re perfect with the color scheme. Thank you ! Soooo glad you talked me into them. They were just what I needed in that set. All that color. Scrumptous!